Today a little bit of UK inspiration in honor of Will and Kate. (Hope you’re not already suffering Union Jack overload.) If you’ve been around for a while you know I’m a bit of an Anglophile. (Hence the desire to make my own Union Jack quilt.) I’ve lived in England a couple of times, 3 months in London as a student and later 18 months in the northwest (Manchester, Liverpool and the Isle of Man). I think I left a piece of me over there. You can see more of my favorite British images on my Rule Britannia Pinterest Board. And a few more of my own blocks. Maybe this summer they will finally get sewn together. And speaking of the UK, anyone watch Upstairs, Downstairs? Thoughts, opinions? Comparisons to Downton? Have a festive weekend. Cheers my dears. |I love your union jacks! 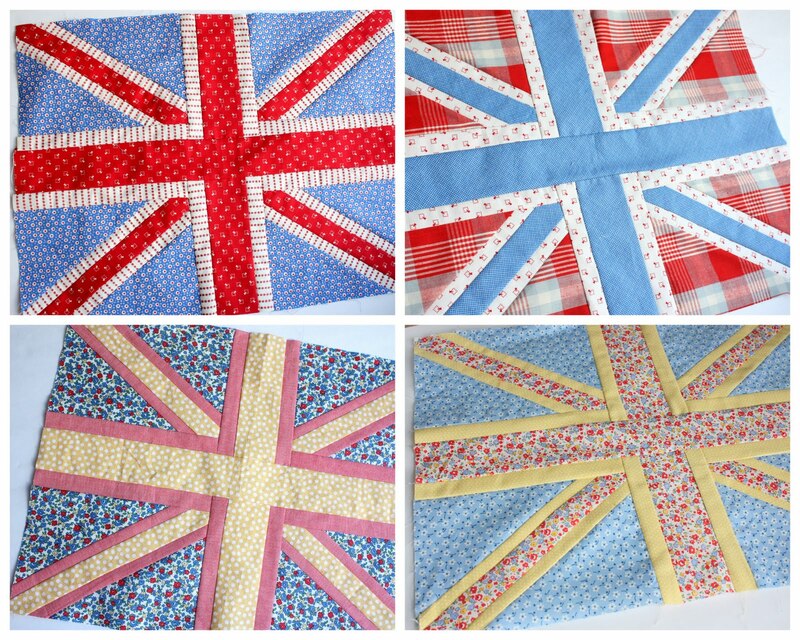 So many great projects using the Union Jack! Having lived in London definitely adds to all the excitement. 🙂 Now I know how we have a common friend…missions! Have a wonderful weekend. i love your union jack blocks! and that sarah jane print is simply adorable! I&#39;ve been really enjoying both Upstairs, Downstairs and Downton. I&#39;d didn&#39;t see the original Up/Down, but I don&#39;t think that&#39;s detracting in the least from the experience. I think it&#39;s interesting some of the similar themes between the 2 progammes, but I do prefer Downton. I can&#39;t wait for the next season to come out! What a nice post with great photos! Thanks for sharing them with us. Aww, I love those bride and groom cupcakes! Love it! Unfortunately I have only seen the UK on the inside of a Heathrow Airport. I need to remedy that one day! I&#39;ll watch parts of the wedding with my daughter tonight! I woke up accidently so I watched the wedding and loved it! Also your flags are wonderful! I am not as crazy about Upstairs, Downstairs as i was about Downton Abbey. I loved that! I&#39;ve never even heard of the movie you mentioned, is it on television. Dang, I&#39;ll be sad if I missed it, I love these types of movies. So I was all excited about the quilt market until I realized it wasn&#39;t for the &quot;general public&quot; Do you know if there is a way to get tickets? I love those blocks you made. I wasn&#39;t that thrilled by Up/Down, although I still need to watch the conclusion. Love, love Downton. As you know…. Hi Amy,<br />I´m from Brazil and I found your blog and it´s amazing!<br />Just love your tutorials!! !<br />Here in Brazil I make some patchwork too. If you can, visit my blog: http://itsallaboutpatchwork.blogspot.com/<br />I need to say that here in Brazil everybody was paying attention to the royal wedding and it was beautiful!<br />Fausta. Do you have a pattern for that quilt block?! New to your blog and I can&#39;t get enough.<br />Absolutely love these blocks! Can&#39;t wait to see them sewn together.<br /><br />Great post! I love your Union Jack flag blocks and I was glued to the wedding – I watched it with my mam and she cried a couple of times! As you can imagine, the papers and news are full of the wedding and I love seeing all the photos! <br />Connie, Catherine (Duchess of Cambridge!) bowed her head as as a mark of respect as she received the royal salute from the guards and as they passed the cenotaph. I love all of these – especially the cross stitch!